The Legend of Heroes franchise has had a rocky localization history, but in recent years, XSEED’s commitment to bringing over its more robust titles has led it to a well-deserved place in Western JRPG fans’ hearts. While the Trails in the Sky games are more of a 2D throwback at this point, Trails of Cold Steel attempts to be more modern while retaining that scope and character that make a game a Trails game. It’s a tough task, but those who put the time into Cold Steel will once again be craving more by the time the adventure concludes. 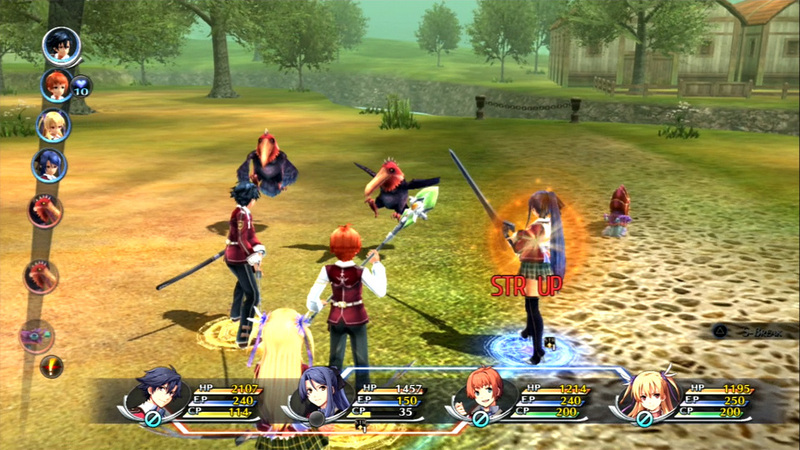 Trails of Cold Steel is a member of the Persona, er, school of JRPGs, with an academic setting, a leisurely pace and a focus on building relationships with classmates for more successful outings in battle. You talk, then head into dungeons, then do the whole thing over again the next day. 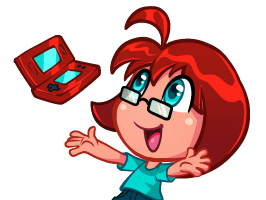 The game’s characters start out rather one-dimensional and get some mild depth as the adventure continues, but each is meant to play a specific role. Elliot, for example, is always your amiable best bud, and Fie is going to interact and speak as little as others will let her. Machias and Jusis are stand-ins for the two sides of the country’s brewing political strife, and Gaius is the foreigner serving as a stand-in for the player when the game needs to explain the world and its lore. 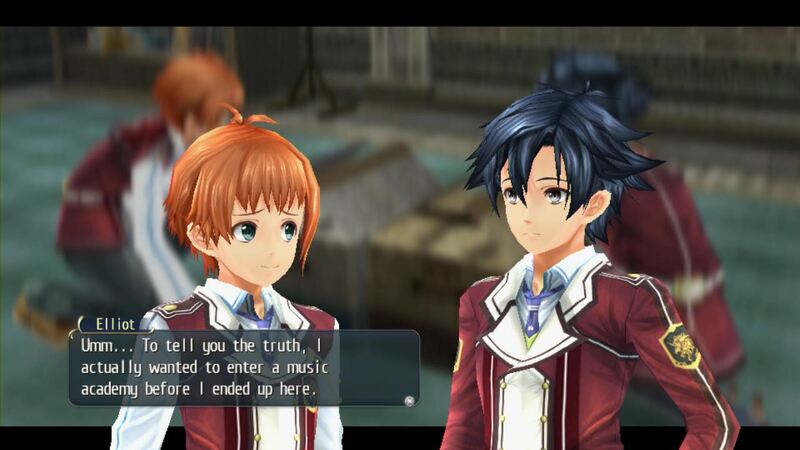 Trails of Cold Steel is a member of the Persona, er, school of JRPGs, with an academic setting, a leisurely pace and a focus on building relationships with classmates for more successful outings in battle. 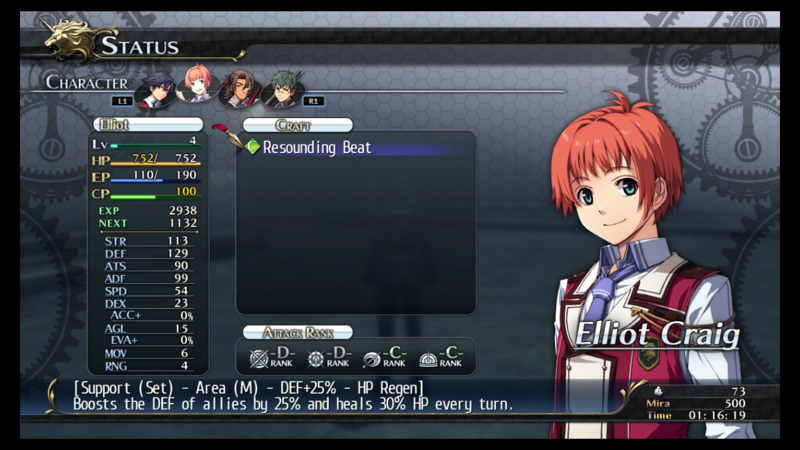 Despite being turn-based rather than real-time, Cold Steel‘s battle system bears many similarities to Tales of Xillia, with tactical positioning, linked pairs, screening casters with melee-focused units and examining enemies to exploit elemental weaknesses. Units never get too far apart like as games like Lost Dimension, so this positioning is much more about keeping as many units as possible in range of your area attacks and scattering enough yourself to be less vulnerable to the enemies’ wider attacks. Which, again, feels a lot like Tales. In fact, there are a lot of Tales parallels here. I suppose that makes sense; both franchises offer a meat-and-potatoes sort of JRPG experience, keeping things fresh with new tactical gameplay features while otherwise wanting so badly for players to think it’s 1997 again. There’s cooking, fishing, a card game… the sorts of bonus activities that were way more common in that era and feel like something of a throwback now. 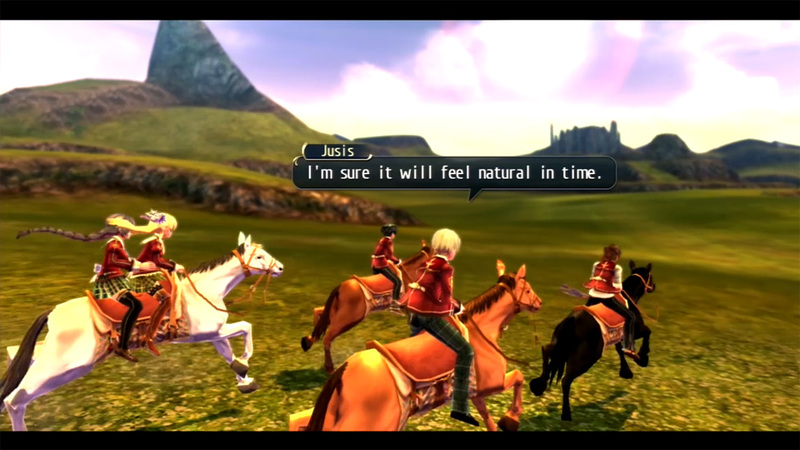 But it’s also Trails, which means it has that profound narrative depth and world-building of the Trails in the Sky games, or at least as much as can be managed in the confines of a polygonal world. It hasn’t abandoned its Legend of Heroes roots, but its fresh surroundings have led it to adapt to what people expect in the post-2D era. Much like in the world itself, there’s a lot to dig into when fleshing out your characters’ combat abilities. You unlock and craft abilities largely through Quartz, many-colored denominations of gems that you accrue rather rapidly and consistently so whatever you need is just a bit of grinding away. Each character has a suite of Arts (which are more like magic) and Crafts (which tend to be weapon-based skills), and these can be varied as well. You’ll likely find one or two you like best; I used Elliot’s Resounding Beat at every opportunity, because when is a defense boost and over-time health regeneration not a good thing? It’s his first Craft, and he gets others but that one never goes out of style. While multi-platform releases have a checkered history in terms of execution and performance, the PS3/Vita-only titles tend to fare a bit better thanks to similar horsepower. That’s definitely true of Cold Steel, as the only significant issue with the Vita version is a bit more loading when moving from area to area. Thankfully, some of the more highly-trafficked areas, like the school building, are stitched together so that not every door leads to a loading screen. Still, it’s a thing to know, and always unfortunate when you’re on the go and in a hurry. On the plus side, there’s no save restriction, so you can stop whenever you’re not in a battle and not have to worry about sleep mode. There’s also a cross-save functionality and cross-buy for add-on items, but the game itself is a one-platform-per-purchase release. Trails of Cold Steel hasn’t abandoned its Legend of Heroes roots, but its fresh surroundings have led it to adapt to what people expect in the post-2D era. Cold Steel‘s localization is solid. There are some flat lines here and there, but generally the voice acting has a decent amount of life and character. I wouldn’t go so far as to call anyone in this game a “normal” speaker — everyone’s a bit unhinged in their own way — but the characters are consistent in their peculiarity and never feel stilted or awkwardly translated. It’s nice to know that XSEED is working on Cold Steel 2 as well, as it means both a lessened wait for the sequel and a consistent voice provided by the same localization team. It’s a comforting sort of thing that is a given for most franchises, but The Legend of Heroes has had no such luxury until now. 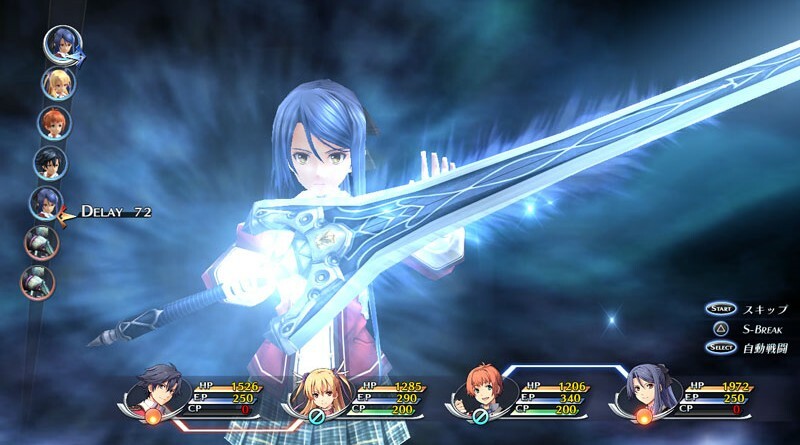 The Legend of Heroes: Trails of Cold Steel is a slow burn, a game that will endear itself more to those who want to settle down for longer. What makes that work more than usual, though, is that it doesn’t start off dragging nearly as much as other games of its kind. Its pace is still a plodding one, but it effectively shows where it’s going and gives you enough to start to make the journey easier.